May is dedicated to raising awareness for osteoporosis, the silent, progressive disease characterized by decreased bone density and increased bone fragility. Osteoporosis is much more common in women than in men, with around 80% of all cases occurring in females. Teenage and developing women are encouraged to build strong bones through proper nutrition and exercise early on, as the consequence of weak bones later in life can be debilitating. May is the perfect month for women to become educated on ways to prevent the disease. Osteoporosis may progress silently for decades, with no symptoms until fractures occur. Bone loss is the major risk factor that can be modified in mid-life to reduce fracture risk, so, early detection and intervention are crucial. Those concerned about their likelihood of bone loss are encouraged to have a bone densitometry, or DEXA, scan. This simple screening helps doctors accurately diagnose osteoporosis by measuring bone density and can help gauge the probability of developing it in the future. 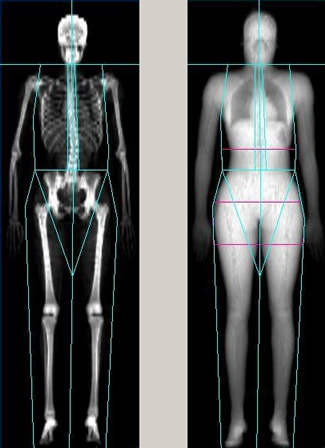 The board-certified radiologists at Lake Medical Imaging utilize DEXA (dual-energy x-ray absorptiometry) scans to categorize patients as normal, osteopenic (a low bone mass that is not as severe as osteoporosis), or osteoporotic; a full report is then sent to the patient’s physician. Medicare and most private insurances cover the test every one to three years, depending on the expected rate of loss and other clinical criteria. DEXA has been established as a valuable clinical tool for assessment of patients suspected of having osteoporosis. The earlier the diagnosis of bone loss, the better the chances are for modification of potential future osteoporotic fracture through pharmaceutical intervention and resistance exercise.